William of Mass Destruction: Elliott The Good Boy. Unlike some cats around here, I don't wiggle and move all about so Mom can't take an in-focus picture. I know that the stiller I am, the faster the shoot. Mom's happy and I'm happy. And the sooner I get to enjoy this sunny spot and fresh air in front of the open sliding door! Elliott, let's hope others learn from your example! You really are seriously good pal! The joy of being an older cat is that you are a smarter cat! And you make a great model! Elliot, you are looking very pantherish today. Enjoy the fresh airs and sunpuddle. Dad says three cheers to that "Mom's happy, I'm happy" thing. He knows all too well how that is!!! 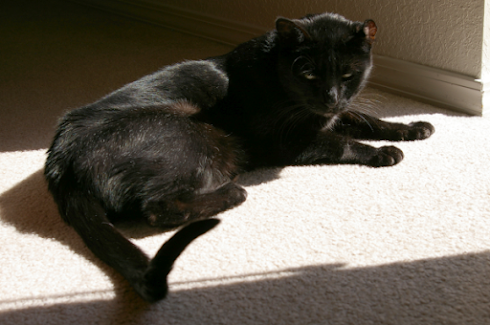 Elliott, that bright sun looks so good on your black fur. We know you are a sweetheart Elliott. You make a good point about sitting still ta get the pictures done with. Sadly, we don't warnings so pics happen randomly for us. So that's the secret of getting the photo shoot over with. Note to self: Be like Elliot.